You have been trying to get pregnant and now you’ve been told you need to lose weight. Losing weight can be difficult under any circumstances, but the added pressure of losing weight to improve the likelihood of becoming pregnant can make the task seem even more challenging. Fortunately, losing as little as 10% of your body weight can make a dramatic impact on your fertility. How can you enhance your overall health and improve your likelihood of becoming pregnant? While your doctor may advise you that weight loss is important to improve your chance of pregnancy, it’s not the sole reason to make a change. With pregnancy and children come additional responsibilities so why not take ownership of those responsibilities now? Shift your focus from losing weight to something more like “nutritional self-nesting.” Use this as an opportunity to phase-in the changes you would make during pregnancy anyway. You can develop the healthful habits you want to model for your family in the future and, as a result, position your body to be more receptive to fertility treatment. Following are just a few ways to get started. Most of us are not getting the 5-9 servings of fruits and vegetables our bodies need to maximize our health. Fruits and vegetables are loaded with antioxidants to help repair the daily wear and tear life puts on our bodies. They also are loaded with fiber to help you feel full and stay regular. Fruits and vegetables help you stay hydrated and deliver essential vitamins and minerals your body needs to function. Look for ways to increase your fruit and vegetable intake by filling up half your plate with these nutrient-packed foods. You can add fruits or vegetables to just about everything –-eggs, pasta, smoothies, yogurt, pizza –- to meet your daily needs. Making this change will help you feel full longer and crowd out room on your plate for less nutrient-dense food choices, which will reduce your overall calorie intake. You probably have no intention of drinking once you get pregnant or start nursing, but if you sometimes consume alcohol now, why not cut down or cut out alcohol to prepare your body for pregnancy? Alcoholic drinks are heavy hitters when it comes to calories, but do not provide any nutritional gain in return. Depending on the number, size and sugar content, alcoholic drinks can easily derail your weight loss goals even if you only imbibe on the weekends. Additionally, you are more likely to make unhealthy food choices while under the influence. Yes, there can be cardiovascular gains to a glass of red wine here and there if you already drink, but recommendations for women are still limited to no more than one serving of alcohol a day. My daughter is only one year old and is already deep into her mimicking phase. She repeats gestures and sounds and even prefers to eat what we are eating. The “pre-conception” phase is a good time to begin habits that you will want your child to mimic. Take inventory of some of the behaviors that you intend to change with pregnancy or post-partum. If you have promised yourself to stop smoking, cut out caffeine or start exercising because you know it will be good for your baby, start now. These are not small undertakings and it would be better not to go “cold turkey” when you get that wonderful positive pregnancy test. Working on these changes now gives you more time to solidify these healthful habits and get your body ready for pregnancy. Best of all, you will already be modeling healthy behaviors when that little one makes his or her appearance. My philosophy is that improving nutrition and exercise is akin to the fabled race between the tortoise and the hare. ”Slow and steady” lifestyle changes are going to help you cross that finish line to a healthy life. If you take the “quick-fix” hare approach (read: “fad diets”), you may see initial results, but they are typically not sustainable and do not lead to winning the long-term weight loss race. You certainly do not have to make these improvements all at once, but taking them on in the near-term will not just mean putting your body in the right condition for fertility, but starting lasting, healthful behaviors that will support a healthy pregnancy and help you raise a healthy family. Of course, you do not have to develop a plan alone. Seek the help of a Registered Dietitian to help you set realistic and attainable goals for pre-conception and beyond. Pile on the fruits and vegetables – Yes, fruits and vegetables are important for everyone, but even more so for the day-to-day athlete. Repeated exercise breaks down the body via oxidation and inflammation. The answer to help clean up the system is antioxidant-packed fruits and vegetables. No other portion of MyPlate can provide the vitamins, minerals and antioxidants necessary to restore the body after a tough workout. Expand the size of your plate -While most people can get away with the guidance of using a 9 inch plate to helpmaintain portion control, that is unlikely to be sufficient for an athlete. The amount of calories an athlete needs to sustain training and muscle repair is highly variable, but most athletes exercising at least 6o minutes a day will need to expand the size of their plates while keeping the five food groups in check. Carbs rule the world – Hopefully it’s no surprise to athletes that their primary fuel needs to be carbohydrates. Simple carbohydrates provide quick energy while complex carbohydrates can sustain athletes for longer workouts. While a detailed, individualized training plan will have periods of increased (during training) and/or decreased (during race prep) carbohydrate intake, most athletes can fill up the grains, fruits, vegetables and dairy portions of their MyPlate to meet their requirements. Protein for muscle repair – Again, the literal wear and tear that exercise puts on an athlete’s body makes the protein portion of MyPlate essential. Athletes do typically need some extra protein compared to the average joe, so strive to pack protein into snacks, leverage protein from dairy selections and even eek out some extra in protein-filled carbs and vegetables like quinoa, whole grains and soybeans. Plan snacks around pre-fuel and post-workout recovery – To maximize a workout, it’s important to be deliberate about the timing of meals snacks. Frankly, athletes need think of meals and snacks as pre-fuel and post-workout recovery tools. Pre-fuel meals and snacks need to focus on hydration and carbohydrates to sustain the workout. Post-workout meals and snacks need to have a mix of carbohydrates and protein to replenish glycogen and repair muscle. Great recovery snacks include smoothies, chocolate milk, yogurt, a peanut butter sandwich, nuts and dried fruit and/orcheese and whole fruit. Don’t forget oil and fats – Depending on your training regimen, it might be difficult to meet daily calorie requirements. No big deal right? Wrong! Calorie deficits lead to muscle breakdown, fatigue and impaired performance. The easiest way to make up discretionary calories is by adding oils and fats to your diet. Athletes can help meet their caloric needs by adding oils to pasta and salads and eating foods rich in healthy unsaturated fats. Focusing on omega-3 fatty acids from ground flax seed, walnuts, salmon, grass-fed beef, soybeans and chia seeds will also provide extra calories that have anti-inflammation affects. If you are an athlete reading this post, I hope I have at least conveyed that you need to take your diet seriously. You need to think of food as your fuel and recovery prescription. 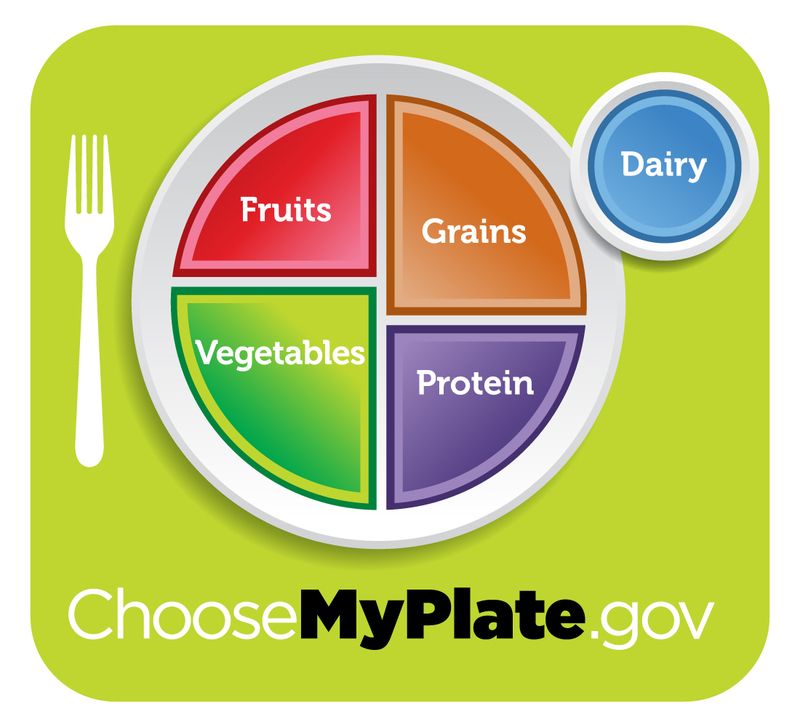 MyPlate is a wonderful tool to guide athletes to eat for performance and frankly Eat2Win! Need additional inspiration? Here are some “performance-enhancing” meals from the pros and Outside Magazine – 11 Athletes Share their Favorite Meals. Have a favorite pre-workout or recovery meal that you would like to share? Need help finding a nutrition plan that meets your Spring training needs? Let me know and we can work together to build a fuel plan tailored just for you and your upcoming training season. So I guess if I had to label myself I would say I’m a part-time registered dietitian, wife and mom of one beautiful daughter with another one on the way. I could also add daughter, sister, aunt, house manager and all-around-Ms-Fix-It. Whether you are a WAHM, SAHM or traditional working mom, one thing is undoubtably common to us all – we are all beyond busy and could use a break when it comes to meal planning and feeding our family. Thus I wanted to dedicate a blog during National Nutrition Month (NNM) to busy moms that included some useful tips to make mealtime a little more like “a day at the beach” and a little less like “Grand Central Station”. Here are some of my tips to help busy moms feed their family healthy MyPlate meals, help fuel their day and set a good example for their children. DO plan your meals and shopping in advance. I’m an uber planner, but I totally get if you are not. I’m generally not going to push my calendar-driven, iPhone-managed, list-making life on you; however, if you want to eat healthy and feed your family healthy meals, you have to plan in advance. This means having a plan when you go to the grocery store. At the very least you need to know what meals you are going to make that week and what ingredients you need to pull that off. I use an iPhone app to track my grocery list, but yours might be paper or even just mental. It’s key that you know what you are doing ahead of time so you can prep between phone calls or when the baby is napping instead of staring into your refrigerator or freezer right before dinner and praying for inspiration. DO take healthy short-cuts. I love to make my own baby food, pasta sauce and even bread, but let’s be real, that is not happening for every meal, 7 days a week. I take short-cuts, but I try to make them as well-informed as possible. I buy jarred pasta sauce (I like Newman’s Own Organic Tomato Basil Sauce and if I have time I add in fresh mushrooms, bell peppers and olives). I buy frozen vegetables so I always have broccoli, peas, sweet potatoes and mixed vegetables on hand. I even buy some processed foods like turkey meatballs, falafel and breaded chicken breasts that I can keep in the freezer. All you have to do is take the time to read the ingredient list and find ones that are minimally processed, lower in sodium and generally have ingredients you recognize as food. Take the time to do it once, find your “brand” and then it’s automatic. DO cook in batches. I make lasagna, chili, pasta and enchiladas like I’m feeding an army. Buy yourself some freezer-safe glassware or disposal aluminum trays and make at least double the quantity so you have enough left over to pack in kid’s lunches, have for lunch or dinner the next day and most importantly, freeze you so you just pull something out of the freezer when you are rushed or plain exhausted. You’ll want to label it with a name, freeze date and maybe some quick re-heat instructions. You might also want to keep an inventory list by your fridge so you know what you have in your downstairs freezer and you can take fully advantage of your precious emergency stash. DO dust off your slow cooker and make casseroles your friend. When I was single, I may have been know to turn my nose up at a slow cooker and casserole, but we have been reacquainted and are now official “besties” in my busy-mom-working-married life. Casseroles are great because you can prep them ahead of time, freeze them for later and toss in lot of vegetables to feed your family healthy. Slow cookers are great for many of the same reasons and they let you make large batches and develop hearty flavors while the meal simmers all day. There are so many books and websites dedicated to just casserole and slow cooker recipes including MyPlate on Pintrest. I urge you to experiment and find your family’s next favorite dishes. DO come up with your family’s staples meals – Have a few staple meals that you can always turn to when you have put off grocery shopping for an extra few days or just come back from vacation. These are staples because you always have the ingredients on hand and they are generally not perishable or have a long shelf life. This can be tuna, veggie and cheese macaroni because you have veggies in the freezer and a pouch of tuna and box of macaroni and cheese in the pantry. It could also be chicken parmesan since you have frozen, breaded chicken breast and marina sauce that you can serve over pasta or maybe quinoa. Along with your staples meals goes a staple shopping list. Again, it can be mental, but something you can print out every week or two works well. You can post it on your frig, cross off the items as you run out and throw it in your purse to reference as you run through the grocery. DO keep healthy snacks on hand…and maybe even in the car – Errands are going to run long or your kids are going to be famished when they get home from school or you pick them up from the bus stop. Again, be prepared. Have fresh fruit, dried fruit, nuts, whole wheat crackers, yogurt, Wholly Guacamole snack packs, hummus, cheese sticks, Kind bars or easy to grab veggies like baby carrots and cherry tomatoes on hand at all times. Don’t forget to treat yourself to 2-3 snacks a day to keep your energy level going and your metabolism revved. DON’T be afraid to get everyone involved in the kitchen. When your kids are old enough, get them involved in meal planning, shopping and even food prep and cooking. Have them select the veggie of the night. Have them come up with an idea for “Try it Tuesday”. Have them peel potatoes, toss the salad or set the table. DO make it a priority to sit down as a family – I know this is a hard one with crazy work schedules and sports practices, but it’s critical that you pick a few meals a week to sit down as a family. It doesn’t always have to be dinner. Find a time that works for your family and have everyone commit to making it a priority. If it’s not a priority, I guarantee it will be overcome by events. This is important so you can prepare a meal as a family, sit down at a table and talk about your day. Your family is invested in the meal, they see you eat healthy, home cooked meals and they follow suit. DO KISS – And like this last point, Keep it Simple Silly ;-). Find recipes with 5 ingredient or less or take 10-20 minutes to prep. You don’t have to be a gourmet chef to feed your family healthy meals, but you do have to plan ahead, make it a family priority and find a groove that works for your family. Are you a busy mom who strives to feed their family healthy meals? Share your favorite time-saving tip or favorite family recipe to inspire the rest of us. DO fill half your plate with the wide variety of fresh fruits and vegetables that are native to Texas and Mexico including tomatoes, tomatillos, lettuce, onion, bell peppers, chili peppers, squash, cactus, potatoes, sweet potatoes, peas, corn, jicama, avocados, bananas, strawberries, melon, oranges, mangos and papaya. DO watch your portion-sizes. Everything is bigger in Texas. So much so, you hardly notice how big your plates and portions are while dining out. MyPlate is a great way to keep these things in check. First it helps you limit protein and grains each to 1/4 of your plate, leaving you room to pile on your fruits and veggies on the other half. Most people just need 3-4 ounces of protein (about the size of your palm). This includes beef, chicken, pork, fish, beans and eggs. It helps to think of the protein as more of a “supporting actor” and not the star of the show. Finally, consider leaner protein options including poultry, fish and beans. DO opt for healthier fats and cooking methods while cooking. I’m not going to lie, I grew up on food cooked with lard and bacon grease. Today, I typically cook with olive and canola oil which have higher amounts of poly- and monounsaturated hearty-healthy fats (liquid at room temperature) versus the artery-clogging saturated fats found in lard and animal fats (typically solid at room temperature). I also bake things like tortillas for chips and chalupas instead of frying. I sauté chicken, fish and vegetables with a little oil which absorbs much less fat versus deep-frying. DO take advantage of the zest, spice and flavors of Tex-Mex cooking by a using lime juice, garlic, cumin, chili pepper, cilantro and onion in your cooking. DO cut out the sugar-sweetened beverages. While not Tex-Mex specific, their use is certainly rampant in my home town and the size of these beverages is astonishing. Almost every fast-food chain and restaurant lets you treat yourself to unlimited beverages. What I did not realized until after college is how that was affecting my blood sugar, mood and frankly ,waistline. A Big Gulp – and that is the small one these days – has 350-400 calories and 90-100 g of sugar depending on how much ice you take. I would rather eat my calories and make them nutrient-dense. DON’T overdo the carbohydrates. Only a 1/4 of your plate should be grains and mostly whole grains at that. For most people this means one slice of bread, 1/2 cup of cooked rice, 1 small (6 inch) flour or corn tortilla OR 1/2 cup of cooked pasta. As Mexican-Americans, we tend to overdo this area of our plate. We have to choose between the rice and the tortilla and limit ourselves to one, not the typical two to three tacos that come with most meals. DON’T overdo the dining out. In Texas, it takes a lot of discipline to maintain a healthy MyPlate while eating out. You should probably only eat 1/2 to 1/3 of what your are served at some Texas restaurants to keep proper portions (take the rest home for tomorrow’s lunch). Also, you don’t know how the food is prepared so it’s likely to be full of unhealthy fats and salt that you can better control when cooking at home. DON’T derail your healthy plate with calorie-dense condiments like full-fat sour cream, salad dressing, mayonnaise and/or shredded or melted cheese. 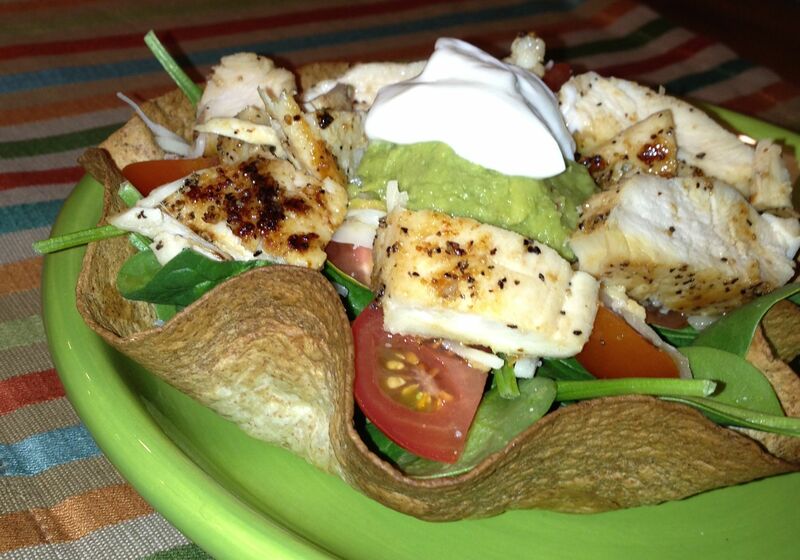 Look for additional inspiration by browsing MyPlate Recipes on Pintrest. I hope this first NNM post helps other Tex-Mex lovers see that they don’t have to sacrifice their favorite flavors when eating healthy. With a few modification and tweaks you can still Eat Your Way, Every Day, the Tex-Mex Way! Let me know any healthy twists you have made on your Tex-Mex favorites! With the start of March next week comes many great things. Spring starts on March 20th and March 13th is Registered Dietitian Day. Most importantly the entire month of March is National Nutrition Month. This year’s theme is “Eat Right, Your Way, Every Day”. I’ll be blogging for National Nutrition Month and helping people understand how to incorporate this theme into their everyday food choices. At the heart of this theme is a recognition that there is no ONE right way to plan your diet. You don’t need to go vegan or gluten-free to be healthy. People come from different cultures, have had unique food experiences and thus develop individual taste preferences. This is about making meal planning and food choices based on what is right for you, your personal preferences and individual lifestyle! Let’s say you are Hispanic (like me!). Just because some of our traditional foods are fried in unhealthy fats and are heavy in carbohydrates doesn’t mean we can’t eat foods we love and are nostalgic for in healthy ways. I’ll dedicate an entire blog to show you how I do this regularly. Your lifestyle also plays a large part into how you eat. Are you training for an upcoming half-marathon or are you a working mom trying to feed your family healthy (but quick) meals? Chances are your grocery cart is going to look very different depending on how you answered that question. I’ll cover these two very different lifestyles (the Athlete and the Busy Mom) in my blogs next month and show you how to adapt lifestyle and personal preference while still building a healthy plate. My blogs for National Nutrition Month will provide help with menu planning and tips for personal customization so that you can start eating your way every day! Check back next week and join the conversation. Also let me know if there is a lifestyle or health need that you help making your own. I frequently get asked what my approach is to nutrition counseling so with the New Year approaching, I wanted to layout my philosophy for any new clients that might be looking to get help making their healthy resolutions for 2013 a reality. Food = Fuel. I prefer to focus on what foods I should be eating versus those I shouldn’t eat. Your body is like a race car and it needs special fuel to perform at its very best. It requires protein to build and repair muscle which you get from lean meats and legumes. It requires carbohydrates to give you energy and support your workout routine which you get from whole grains. It especially requires antioxidants which work to repair your body’s daily build up of oxidation (think rust on a race car) and ward off disease which you get from maximizing your fruit and vegetable intake. If you spend your time focusing on what you need to eat fuel your body, you’ll feel more satisfied, feel less deprived and have more energy to get through your day. Get up and move. Making healthy eating choices is only half the battle. You need to exercise or find someway to add motion to your life. Everyone is on their own pace here. Add more to what you are doing if you want to see change. If you are starting at zero then anything counts – take the stairs or walk around the block a few times after dinner. If you are more of a recreational athlete, then it’s about consistency and cross-training to stay healthy and prevent injury. Also don’t forget to fuel your workouts. You wouldn’t drive your race car around on empty and you shouldn’t be exercising without pre-fueling, eating post-exercise for recovery and hydrating to maximize your workouts. Self-accountability. When you solicit my services, we join in a professional and personal relationship. I’m here to help you meet your goals. Over the course of our relationship my role may shift from nutrition expert to counselor to cheerleader to coach. I will give you the knowledge and tools to help you be accountable to your goals. However, I can’t make you change. No matter how much I might want to “will” you to change, you’re the only one who can decide to get out of bed at 5:30 am to get your workout in or keep yourself honest when you are eyeing the portions on your plate. You need to be ready for change. Change has to come from within yourself. You need to be accountable to yourself to make change happen. Small, lasting changes. Making healthy lifestyles changes is a commitment, but it isn’t one that requires drastic, body-shocking changes when the clock strikes midnight. It starts with a nudge here and there…maybe eating out one day less a week or going meatless on Mondays. Then you lean in a little more by drinking less soda and more water or signing up for the yoga class you been meaning to try. Once these changes feel more routine, you can turn things up even more by cooking at home more or working to fill half your plate with fruits and vegetables. The bottom line is that we are talking about small, sustainable changes that don’t scare your body into retreat, have nothing to do with dieting and have a chance of becoming habit. Moderation versus deprivation. My approach is also NOT about extremes. It’s not about cutting something out of your life completely. There is always room for your favorite crutch, it just requires portion control and self-accountability. Working in extremes typically means the change in not sustainable (think No Carb) and then you end up beating yourself up or overindulging when you fall off the wagon. Having something you really enjoy in moderation and being mindful when you indulge will mean you feel satisfied and not guilty at the end. If you like what you have read and need some help reaching your healthy goals, we would probably make a good team. Give me a call or drop me a note and let’s discuss how we make 2013 the year you made your health and well-being a top priority! As a student member of the Northern District Virginia Dietetics Association, I had the pleasure of touring Open Book Farm located in Myersville, Maryland. Mary Kathryn (MK) and Andrew Barnet started Open Book Farm in 2011 after gaining experience in sustainable and healthy livestock practices while apprenticing and volunteering at several farms across the country. They grow a little of everything including a variety of tomatoes, onions, eggplant, melons, peppers, herbs, garlic, a variety of potatoes, kale, cabbage, leeks and whatever else MK decides to experiment with. When we toured last weekend they had rows and rows of seedlings started in the greenhouse and numerous nutritional gems taking root in the field including potatoes, lettuce and leeks. 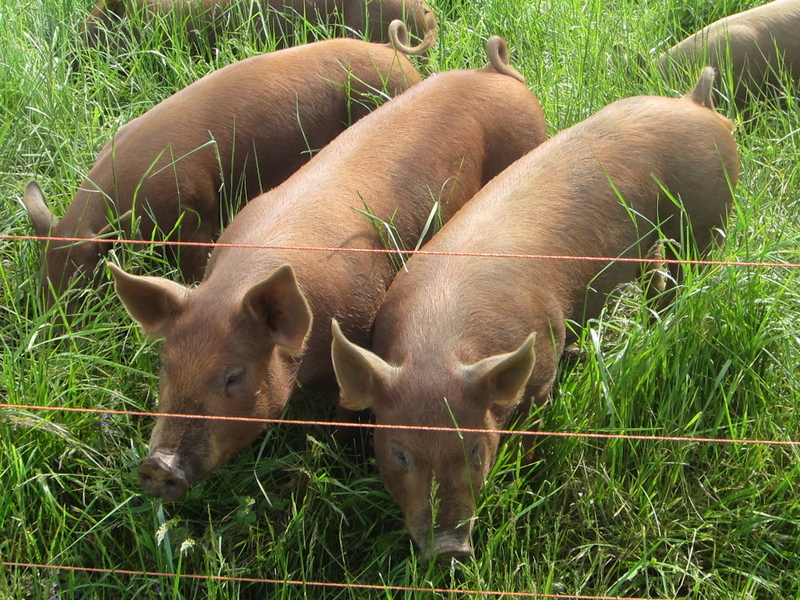 In addition to the produce, Open Book Farm also pasture-raises chickens, turkeys and pigs. I know many of you out there are vegetarians or vegans, but the looks on the faces of these “happy pigs” might just make you reconsider. They continually rotate the land where they pasture their animals. Without rotation even eggs claiming to come from pastured chickens could be eating from the same plot of land with little to no new grass. Next time you are at your local farmer’s market, it’s not a bad idea to ask how frequently they rotate the animals they pasture. 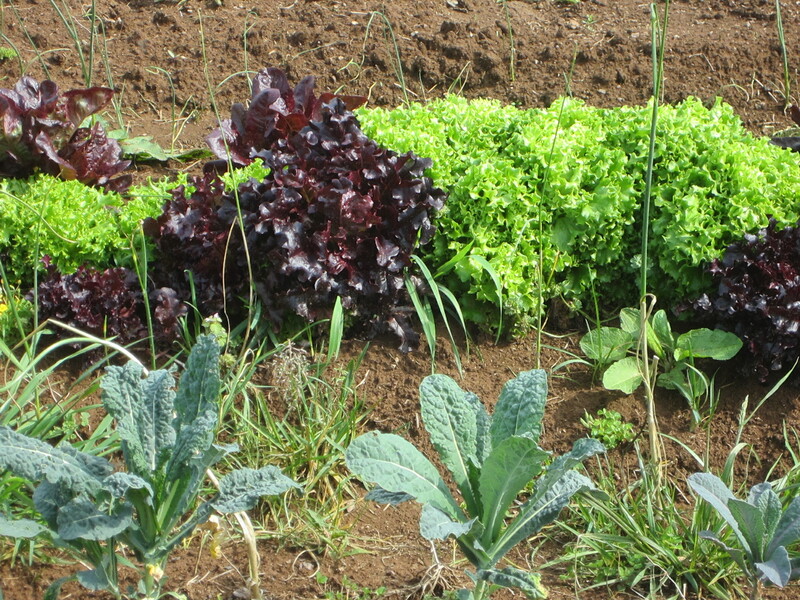 They use NO pesticides, fungicides or herbicides on their crops. Isn’t that what you think about when you think organic? The truth is there are a few of pesticides and fungicides that are permitted under organic standards. They also don’t use antibiotics, growth hormones, or parasiticides (“de-wormers”). Instead they concentrate their efforts on keeping their animals healthy and happy. They use no GMO (genetically modified organisms) seeds. While many of the seeds they buy are organic, they prefer to keep their options open and buy seeds based on price and variety preferences. 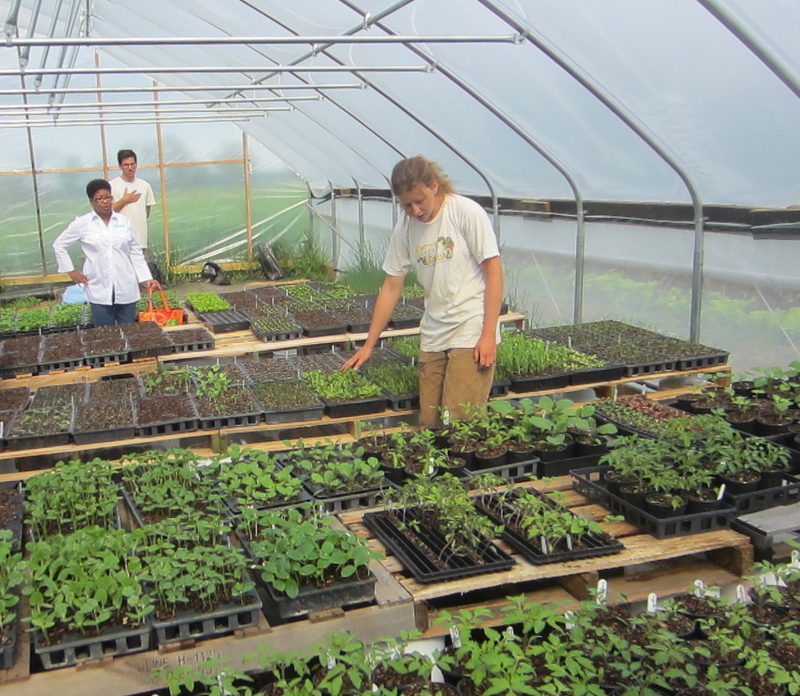 Bottomline is that their growing and farming practices are, like their name. an “Open Book”. Don’t take my word for it, read more about their practices on their Open Book Farm website. They know they may not be for everyone, but take a look, give them a call and/or plan a visit to learn more. I had two major takeaways from this whole experience. The first is to follow your passion. I still can’t get over that this couple found something they loved and put a plan in motion to make it a reality. While they get some help from neighbors and volunteers, they primary run their modest farm and CSA by themselves. Secondly, get to know your food. It’s clear that our disconnection with our food has got us all into more problems than we bargained for. We have let others make decision about what we eat without any accountability. It’s time to reconnect with our food! Even if Open Mind Farm isn’t for you, ask more questions at your local farmer’s market, do research on your favorite supermarket brands or simply start reading your food labels to know what you are putting into your body – and your family’s bodies. The sooner we do a better job of getting to know our food and farmers, the sooner we start giving our health and nutrition the priority it deserves.